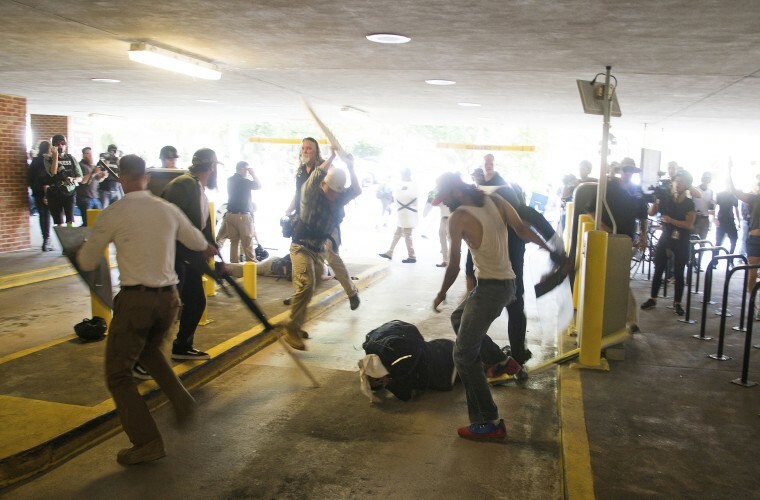 Jacob Goodwin claimed self-defense when he physically attacked DeAndre Harris. But prosecutors say he "came for battle." A white man who prosecutors say "came for battle" when he took part in the brutal beating of a black man during last year's white nationalist rally in Charlottesville, Virginia, has been found guilty of malicious wounding. Jurors on Tuesday recommended a sentence of 10 years for Jacob Scott Goodwin in the Aug. 12 attack on DeAndre Harris. Some of the prison time could be suspended, but he must pay a $20,000 fine. Harris, 20, suffered a spinal injury, a broken arm and head lacerations that required eight staples after the parking garage assault. Three others were arrested. While Goodwin, a 23-year-old from Arkansas, claimed self-defense, Assistant Commonwealth's Attorney Nina-Alice Antony said it was Goodwin who wanted to square off. She acknowledged that Harris had been taunting those in support of the Unite the Right rally, but Goodwin "came for battle," dressed in headgear, goggles and a shield, reported NBC affiliate WVIR. Initially, Harris, a former special education instructional assistant, was charged as part of an earlier confrontation. Harold Crews, a North Carolina lawyer, had said Harris attacked him with a flashlight. It was moments later that Harris was beat in the parking garage next to the Charlottesville Police Department. Harris turned himself in after he was served a warrant for unlawful wounding. A judge in March, however, found him not guilty in the attack on Crews, a state chairman of the self-described white nationalist group League of the South. The judge said that Harris was only trying to defend his friend who had gotten into a tussle with Crews. Photos and videos of Harris being pummeled by pipes and boards went viral on social media, and led internet sleuths to track down the identities of the men involved. Goodwin was one of them. At his trial this week, he said he was in fear for his life when he saw Harris. "I believed I was going to be attacked," he told the court. Harris "came running at me from [the] right side, and fell down or tripped for some reason. So when he tried to get back up, I kicked him because he was previously running towards me," he added. Goodwin's parents, Tamera and Scott Goodwin, were subjects of a documentary published by NBC Left Field last month called, "Path To Radicalization: A Mother Turns to Hate." Goodwin appears in the documentary while in jail. He is expected to be sentenced on Aug. 23. The rally in Charlottesville was held to protest the removal of a statue of Confederate Gen. Robert E. Lee from a city park. A series of violent clashes led to the deaths of three people and more than 30 injuries.